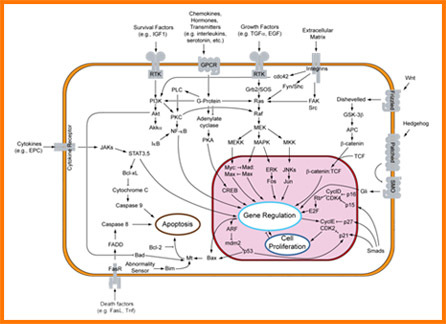 Cytokines, Growth Factors & Hormones | BioVision, Inc.
Growth factors, cytokines, chemokines and hormones share many similarities and act as essential biochemical messengers for housekeeping functions, as well as, having crucial roles in pathological and stem-cell related growth and regulation. Each performs both homeostatic and stimulatory functions. Moreover, typical implications of a positive effect on cell division associated with growth factors are also evident with some cytokine and hormonal stimulatory signals. Indeed, some cytokines and hormones are growth factors and the distinction between them is frequently arbitrary and stems more from the manner of their discovery rather than from a clear difference in function. In addition, some immunomodulatory effects of cytokines are systemic rather than only local. In hormonal terms, this means cytokines may be autocrine or paracrine in chemotaxis and endocrine as a pyrogen.Chemokines, a subclass of cytokines, also show pro-inflammatory and homeostatic activities. BioVision offers a huge repertoire of these essential biomolecules. Our product line comprises over 300 items (with the exception of two, all are recombinant). In addition, we offer a huge complementary line of antibodies to recognize many of these proteins.